Working from home, beavered away in my room, I was staring at my computer screen and ignoring the window. Then I heard a voice call out. My flatmate. My goodness, she was making such a clatter. I sprang from my desk to see what was the matter. Away to the window I flew like a flash, Tore open the shutters and threw up the sash. What do you know, it was snowing. Just another reminder that the Christmas season is upon us, replete as it often is with grumpy shoppers, snarly unions and stranded travellers. It is also the season of Christmas parties. 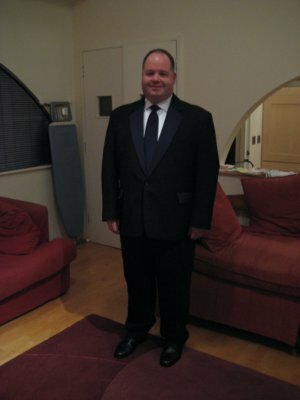 My work party was a couple weekends past, for which I had to wear a dinner suit. I am wearing a regular tie because I couldn't figure out how to work out the bow tie. Especially sad as it was a pre-tied clip on. When one is defeated by an already tied tie, one feels especially stupid. My flatmates have been decking out the flat in Christmas cheer. Pictures of Santa, festival candles, poinsettias and a miniture Christmas tree have appeared in the last few weeks. 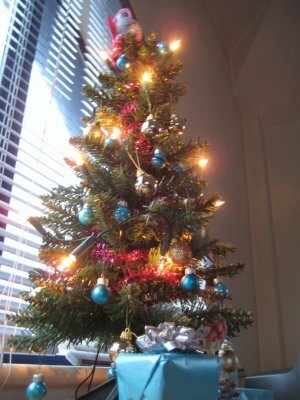 "We have no angel for the top of our tree," one of my flatmates said. I felt like I needed to contribute to the decorating. "Don't worry, I shall take care of that," I said. The next day I bought some pink construction paper and a pink pipe cleaner, and using the candy holders I purchased at the Japanese fair back in September, created a little cherub for the top of the tree. Hello Kitty was born on November 1st, and lives in London, England with her parents and her twin sister, Mimmy. 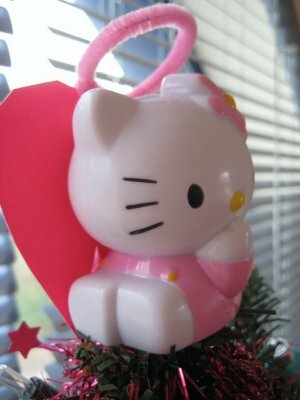 So therefore fitting that Hello Kitty should be the angel atop our tree for my first Christmas run-up in London. Last year I was in Arizona for the run up to Christmas, so this is the first year that I've been here in England. It won't be my first Christmas in England, though. 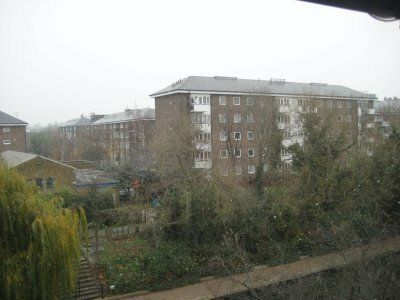 Come next Monday, one of Britain's non-striking airlines, easyJet, will be whisking me away some place where there is likely to be no snow. Happy holidays to all, whatever it is that you celebrate this time of year. I'll be thinking of you. Enjoy!! I love the Hello Kitty Angel. Enjoy Christmas in Marrakesh! Sounds fantastic.